A collection of media features on the Greater Augusta Arts Council, projects, and events. 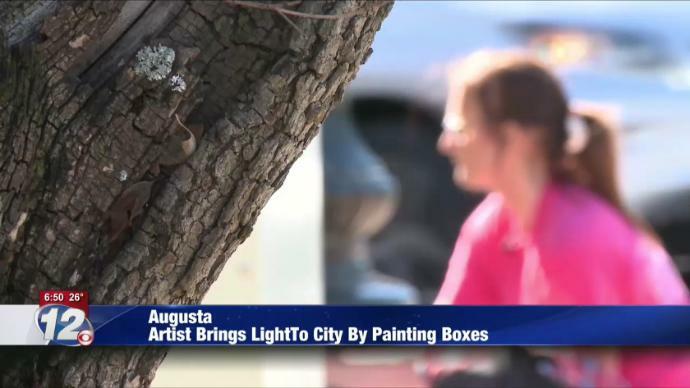 Via WRDW.com -“Neighbors and passerby’s in one of Augusta’s historic neighborhoods have been thanking artist Cyndy Epps.”Typically you paint a painting and put it up on a wall. You’ll hear some feedback but this has been a cool experience,” Cyndy says. Cyndy is painting on a utility box on Gould’s Corner (at the intersection of Walton Way and Milledge Road) in the Summerville neighborhood. Via Augusta.chronicle.com -“The Greater Augusta Arts Council has been working with the city of Augusta and its officials to create more public art opportunities for artists. It’s currently looking for nominations of local artists to serve on a public arts’ advisory panel. The panel is comprised of city leaders, artists and members of the community. Via Augusta.chronicle.com -“The arts don’t just nourish the soul. They provide potent fuel for an economic engine. The Greater Augusta Arts Council has known that for a while, but recently it learned the dollars-and-cents details: Arts and culture generate more than $57 million in direct economic activity for the greater Augusta area. That was one of the biggest takeaways from the Arts and Economic Prosperity 5 survey project, described as the most comprehensive economic impact study of the nonprofit arts and culture industry in the United States. Via Augusta.chronicle.com -“Why have public art? There have been many reasons. It’s said that Ramesses II ordered the carving of the statues at Egypt’s Abu Simbel to intimidate the neighboring Nubians. When Michelangelo’s David was unveiled in Italy in 1504, it stood as a symbol of independence for the Florentine Republic. Via Augusta.chronicle.com – With the last major installation of public art occurring nearly two decades ago, Augusta is a little behind the culture curve. But no more than the average community, one of the nation’s top public art experts said Tuesday. Via Metrospirit.com -“A few days before Hurricane Irma brought tropical weather to the Augusta area, Arts in the Heart of Augusta Festival organizers were wary of what effects it might have on their festival, held the weekend after. The tropical storm blew through on Sept. 11, and the festival took place Sept. 15 through Sept. 17. Via WJBF.com -“Augusta is home to the Savannah River, Augusta National, and multiple historic districts. Still, civic leaders say one thing is lacking– public art that distinguishes the Garden City. A new Public Art Master Plan sets out to fulfill the missing component.